Blue has never been my favorite color. I am not sure why. Based on my eyes I am told that I should wear that color and color analysis says it looks good with my hair and over all complexion. I like more vivid and autumn colors but never sure they like me. I can always fall back to blue and know it works. See my post on color analysis. The above off the shoulder sweater is from Boston Proper, currently on sale ($39.99). It looks good although a little heavy for South Florida, especially during our warm and very warm seasons. A sweater, that is off the shoulder, is very much a contradiction although stylish. My shoulders are tan and I do have the necessary strapless bra. 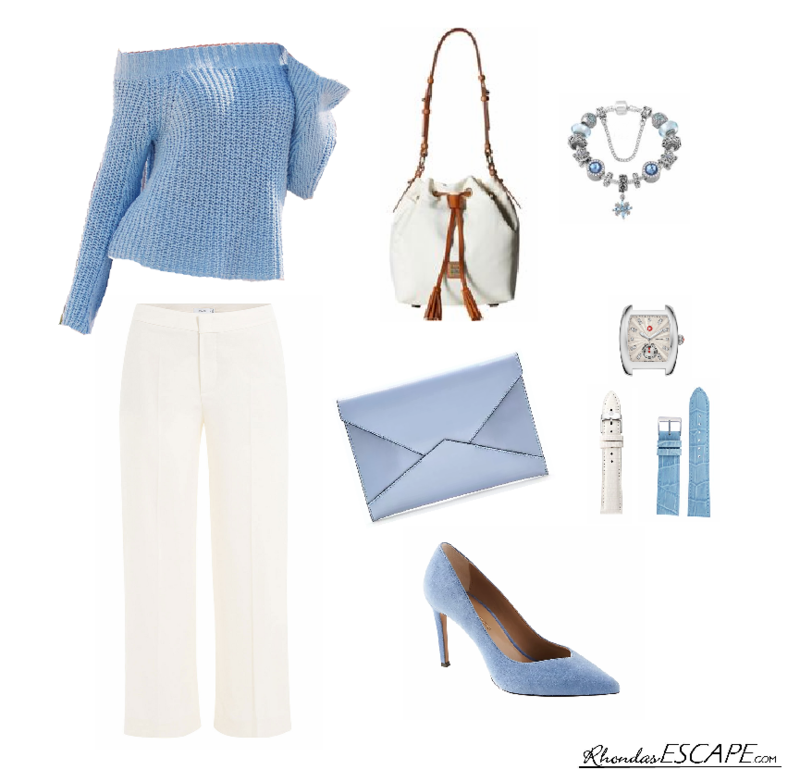 White dress pants are a natural for a cool look and make matching up everything easy. A year round item for Florida. These are my "go to" knit pants from Talbots Windsor and do hang and travel well. The white purse is Dooney and Bourke (Windham Kate Small Bucket). Although it does not show, it is a nylon material, not leather. The suede shoes and envelope bag (pouch) are Banana Republic. Both this season, if you are interested. The charm bracelet is Pandora and the watch is my Michelle. Michelle watches have easily changeable bands. Having the matching blue band pulls everything together and I do have a band in white that would works as well. I have always enjoyed this part of being feminine. The shopping, the planning, the getting dressed and the evening. Sure, it take effort and sometimes a second opinion to get it right. However to look in the mirror as you head out and know that you are "pulled together" is so worth it. Let that double-take you get, be about looking well dressed.